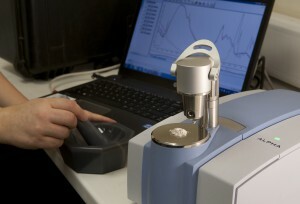 FTIR (Fourier Transform Infra-Red) provides mineralogical and TOC data as percentage abundance from a small rock sample. Only 1 gram of sample is needed for FTIR analysis, it must be finely ground. The rock powder is placed on the ATR diamond crystal stage and clamped in place. Each sample measurement takes less than a minute to run. The sample is then removed, and the ATR stage cleaned, before the next sample is placed on the stage for measurement. 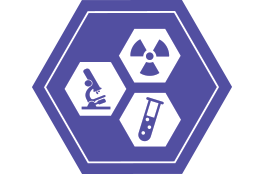 For each well or group of wells to be analysed a bespoke model must be made, usually based on XRD data from the same samples. This ensures an accurate representation of the minerals and their abundances. This model can be made before or after the FTIR samples are measured, and can be run at any time on the FTIR data. Bruker Alpha FTIR with a Platinum ATR diamond ATR module. The Alpha FTIR is small, with a foot print about the size of A4 paper, portable, contains no moving parts, and is simple to use. Thus it is ideal for use at well site or core store, where it can be operated by a local technician. FTIR is inexpensive compared to XRD so is ideal where large amounts of mineralogical data are required.